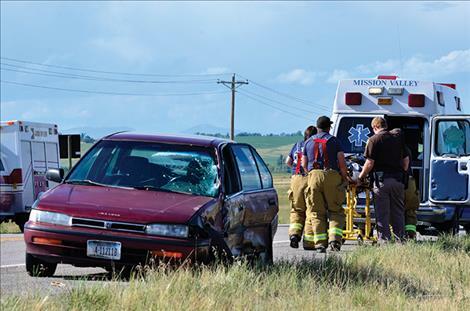 Three people were taken to the hospital after their vehicles collided on Highway 93 near St. Ignatius Wednesday, July 13. ST. IGNATIUS — Three people were taken to the hospital after a collision occurred on U.S. Highway 93 north of the St. Ignatius turnoff yesterday around 5 p.m.
A small maroon four-door Honda was traveling south and a white, mid-size, sports utility vehicle hauling a trailer was headed north when the two vehicles collided. Both vehicles sustained damage on the driver side, rendering the tires out of place. Neither vehicle was operable after the wreck. The St. Ignatius Volunteer Fire Department and ambulance crews responded to the scene. Two adult passengers in the Honda were taken to the hospital along with a 2-year-old child. The child was secure in a car seat at the time of the accident. Emergency responders held the child while the adult victims were loaded into two separate ambulances. A witness said the male driver of the Honda had glass in his face. The passengers in the white vehicle reported to be okay but shaken up. They said it was luck that they missed hitting a semi truck after the collision with the Honda. Lake County Sheriff’s Deputy Chris Clary, who recently graduated from the police academy to join the sheriff’s team, responded to the scene. Tribal Police also responded. The officers kept the three lanes of traffic going while emergency crews helped the victims. 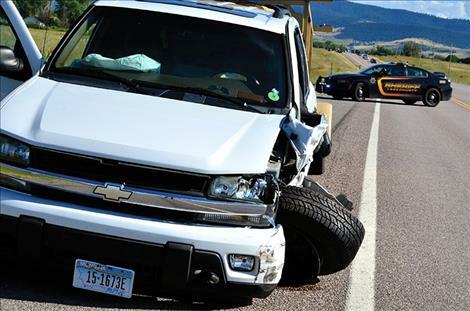 The vehicles were parked along the side of the highway about a quarter of a mile apart. Montana Highway Patrol is currently conducting an investigation.